This Monday I am again joining Cathy at Rambling in the Garden, with a mix of pretty pastels and gold for the Summer Solstice. The golden Aquilegia is flowering well and is clearly a much later sort than the others, which have all gone over now. Do take a look at Cathy’s post with the other contributors linking in there. This entry was posted in Garden, In a Vase on Monday, Plants and tagged Cut Flowers, Garden, Plants, Summer. Bookmark the permalink. I have never seen a golden Aquilegia before. It´s very special. Have a good time together with your sister! Thank you Uta. A yellow aquilegia is quite unusual and I am growing to like it! A beautiful vase that looks like it has grown along the vase for decoration….seems we are using a few of the same flowers…so pretty in a riot of stunning colors for summer. Your vase is the perfect accompaniment for your pretty multi-colored melange, Cathy. I hope you have a wonderful visit with your sister! Thanks Kris! It is cool and wet today, and I only wish I could send you a little rain… Have a good week! Such a pretty vase and arrangement and perfect for midsummer. Your header photo with the red field poppies is gorgeous too. Thank you! I can’t believe it is midsummer already! What a beautiful melange, a whole summer in a vase, Cathy! 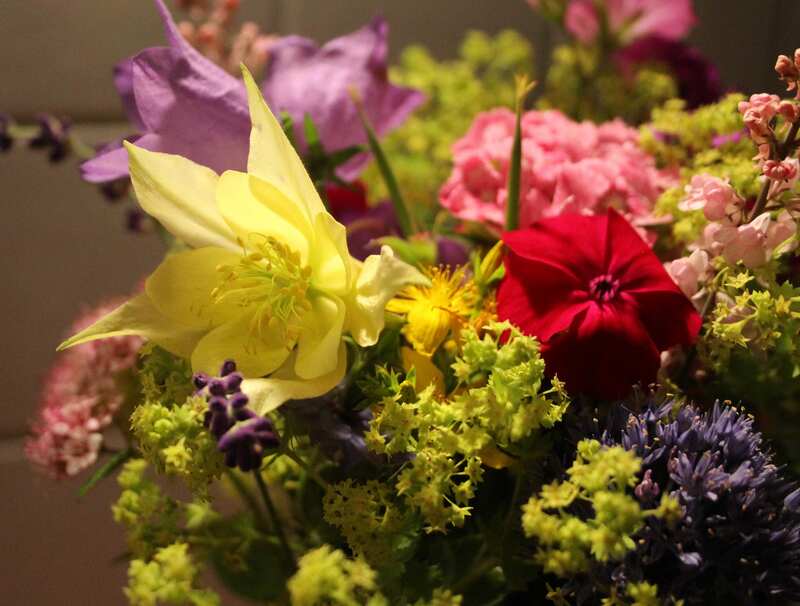 I have put that yellow Aquilegia on my list of must-have, thanks for sharing! Your flowers are such a range of color, and you used some I have around, especially an overabundance of wild oxeye daisies. 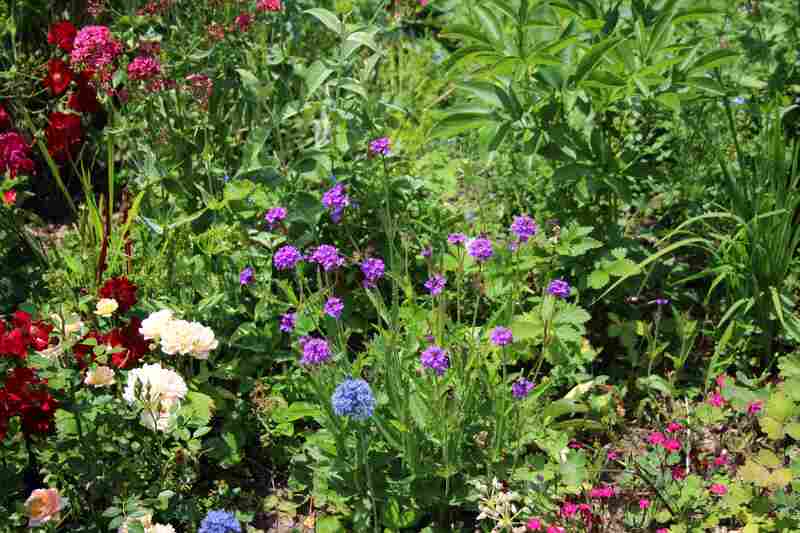 I would love to find a verbena that would self-sow, so pretty. Hi Hannah. My verbenas both self seed…. the V. bonariensis and this one. We had lots of ox-eye/ moon daisies too, but they are more or less over now. A really summery vase this week Cathy, your Verbena could be V. rigida. Thanks Christina. I think you are right! Oh what a cheery vase Cathy. Do you find that your pink geranium seeds about with reckless abandon? I’m trying to remove its presence from various areas of the garden 🙂 Hope that you have a great time in your sister’s company. Thank you Anna. The Geraniums don’t spread much at all actually, as I think it is usually too dry for them in the rockery, but once established they flourish! 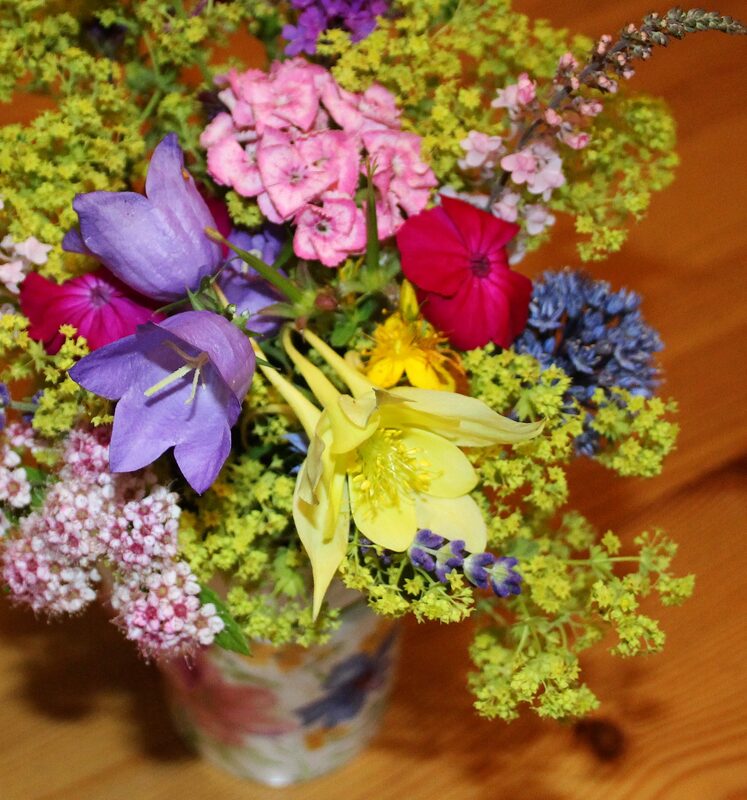 Your delightful summer bouquet helps me to get over the dull fact that summer solstice is already a thing of the past and we’re heading straight for xmas again ;). Have a good week too, Cathy! Oh dear, I had that thought too… only six months to go! LOL! And as my sister said, ‘the nights are drawing in’! And yet summer has only just arrived! A lovely vase this week, Cathy. Your garden must be full of delight right now. I think the plant you asked about may be Verbena bonariensis. It self sows generously, but is quite manageable. Have a great visit with your sister! Thanks Eliza! I have some Verbena bonariensis as well, and it is much taller than this one. This could be Verbena rigida, as Christina suggested in the comments. In any case it is very pretty and I am so glad it turned out to be a hardy one as it was simply labelled ‘Verbena’ in the bargain bin at my garden centre last summer! Gorgeous colour combination! Melange – love that word – I’m going to try and use it as much as I can this week! ha! 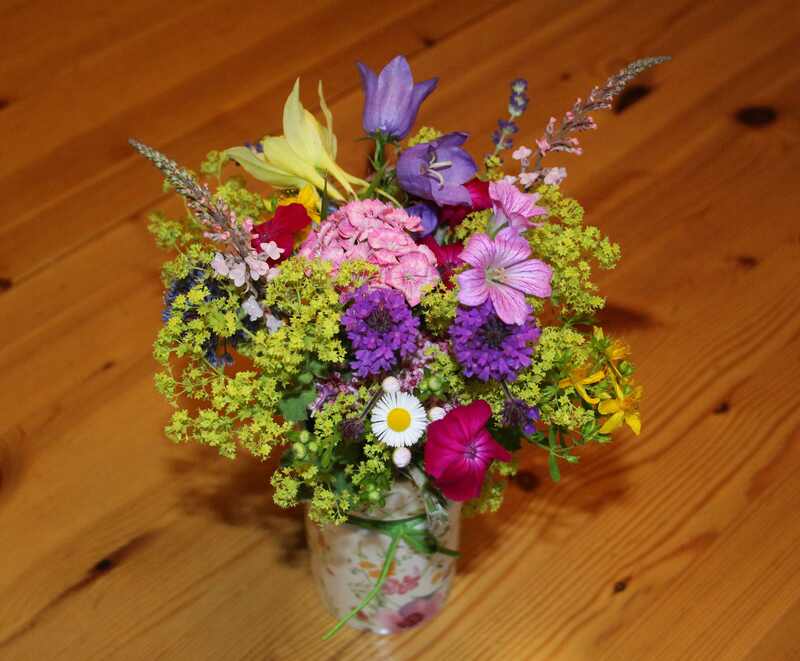 Summer in a vase – yes! Lovely! The golden Aquilegia is spectacular! Enjoy your visit with your sister! I love your summery vase. Alchemilla mollis is beautiful for summer arrangements. It looks like Verbena rigida to me. Have a lovely time with your sister! I like the flower arrangement. The golden columbine looks like such a large bloom for an Aquilegia! It is fairly large and and makes quite a statement in the garden! Still catching up! 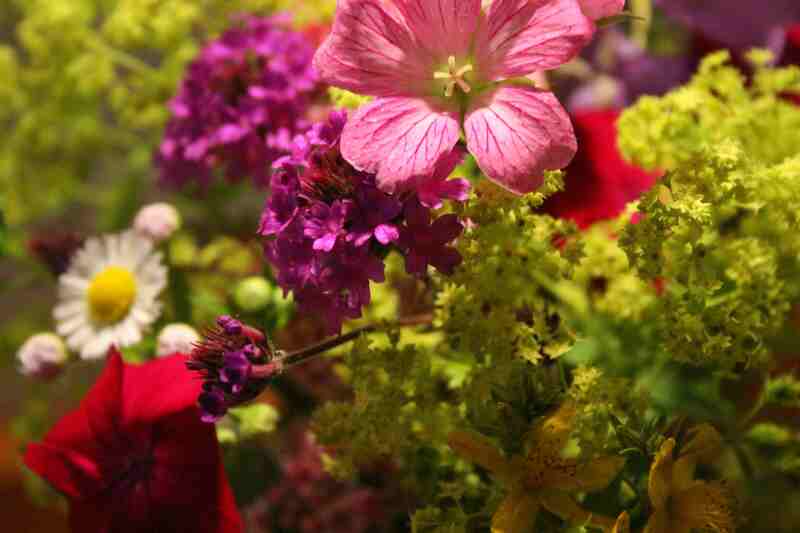 Your summer melange of blooms is gorgeous – and perhaps sums up the joys of summer in the garden. The pure yellow aquilegia is definitely a star – I have just seem n s clump like that in one of the gardens I have just visited but I can’t remember which one! Thanks for sharing – and enjoy the company of your visitor! Thank you Cathy. I do rather like that aquilegia now as it is so summery! It’s a rainy weekend and I’m finally able to catch up! Love the colors on this arrangement, and the yellow columbine makes a great accent… but then I like the bold lychnis and verbena and the frothy lady’s mantle as well. It all goes so well together! Just wondering if you miss your Tuesday’s views. I can’t imagine keeping up with a meme so long, but I did enjoy following along! Thanks Frank! Yes, I was thinking about my Tuesday view and will have to post one again soon! Hope you had a wonderful visit.